MRI sagittal and axial T1w images of brain show faint T1 hyperintensity in left basal ganglia. Clinically pt was drowsy. Relatives complaining of repeated involuntary movement of right half of face and right upper limb. When insisted relative forwarded all previous lab investigations, in that pt’s blood sugar level were abnormal. 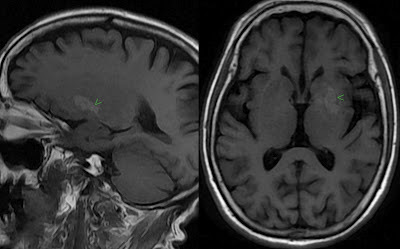 Imaging wise diagnosis: Hyperglycaemic Hemichorea – Hemiballismus. Triple H of Hyperglycemic Hemichorea-Hemiballismus are 1. Unilateral basal ganglionic T1 Hyper intensity, 2. Hyper glycemia / Hyper glycemic coma and 3. Hemi chorea / Hemi ballismus. It is a syndrome associated with nonketotic hyperglycemia in patients with poorly controlled diabetes mellitus, characterized by sudden onset hemiballismus or hemichorea. The most common cause of hemichoreahemiballism in adults is a vascular lesion in the basal ganglia. Rarely, it can also be the ﬁrst clinical manifestation of non-ketotic hyperglycemia, associated with unique radiological features. CT may be normal. May show faint unilateral basal ganglionic hyperdensity. MRI is most sensitive. May show typical unilateral T1 hyperintensity in basal ganglia. Elderly diabetic patients with non-ketotic hyperglycemia presenting with hemichorea-hemiballism, hyperdensity in contralateral basal ganglia on CT scan and high signal intensity in corresponding areas on T1 weighted MRI have been already reported. But there was much controversy regarding the cause of these imaging changes. Initially it was thought to be due to calciﬁcation. Chang and colleagues postulated petechial haemorrhage to be the cause. Stereotactic biopsy and histopathology from the striatum revealed gliotic brain tissue with abundant gemistocytes suggesting that the hyperintensities in T1 could be due to the protein hydration layer inside the cytoplasm of the swollen gemistocytes. These gemistocytes abundantly present in the basal ganglia and cause excessive neuronal activity especially in the GABA-ergic projections and thus may be responsible for generating hemichorea-hemiballism. The basal ganglia hyperintensity generally resolves within a few months rarely reported to remain for several years. So it may be concluded that hemichorea -hemiballism occurring in diabetes mellitus owing to non-ketotic hyperglycemia is a rather benign condition with a good prognostic outcome provided the syndrome is recognized early and corrected. There are many causes of basal ganglionic T1 hyperintensity, majority are related to deposition of T1 intense elements within the basal ganglia. Methaemoglobin in intracranial hemorrhage or hemorrhagic transformation of infarct. Hamartoma in neurofibromatosis type 1. Hyperalimentation or long term parenteral nutrition, manganese toxicity. Causes of unilateral basal ganglioinic T1 hyperintensity are very uncommon than bilateral and are unique. Unilateral basal ganglionic / putaminal CT or MR signal abnormality of nonketotic hyperglycemia to be recognized and distinguished from acute ischemic stroke in patients with acute neurologic symptoms. Although nonketotic hyperglycemia may mimic stroke in clinical presentation and imaging findings, the pathophysiologic mechanisms of this entity are not clearly ischemic, so recognisation of this syndrome is important as it can affect the treatment options. Physicians and radiologists needs to be aware of non-ketotic hyperglycemia and its imaging findings as a cause for a potentially reversible hemichoreahemiballism syndrome. Neurology Asia 2010; 15(1) : 89 – 91, Diabetic non-ketotic hyperglycemia and the hemichorea-hemiballism syndrome: B Shalini , W Salmah. Lai PH, Tien RD, Chang MH et-al. Chorea-ballismus with nonketotic hyperglycemia in primary diabetes mellitus. AJNR Am J Neuroradiol. 17 (6): 1057-64.